— for me to make some final decisions about the decor for our home. We’ve tried hard to stay within our budget and not splurge on too many items. We know the price of our home goes up every time we make a change. Some of the changes are expected and some are necessary and some are just wanted. We decided early on that we wanted hardwood flooring throughout the house — except in the laundry room and art room. The additional expense of hardwood instead of carpet is already included in the overall price of our home. Then, I found this wonderful flooring that seemed so perfect for the look that we wanted. 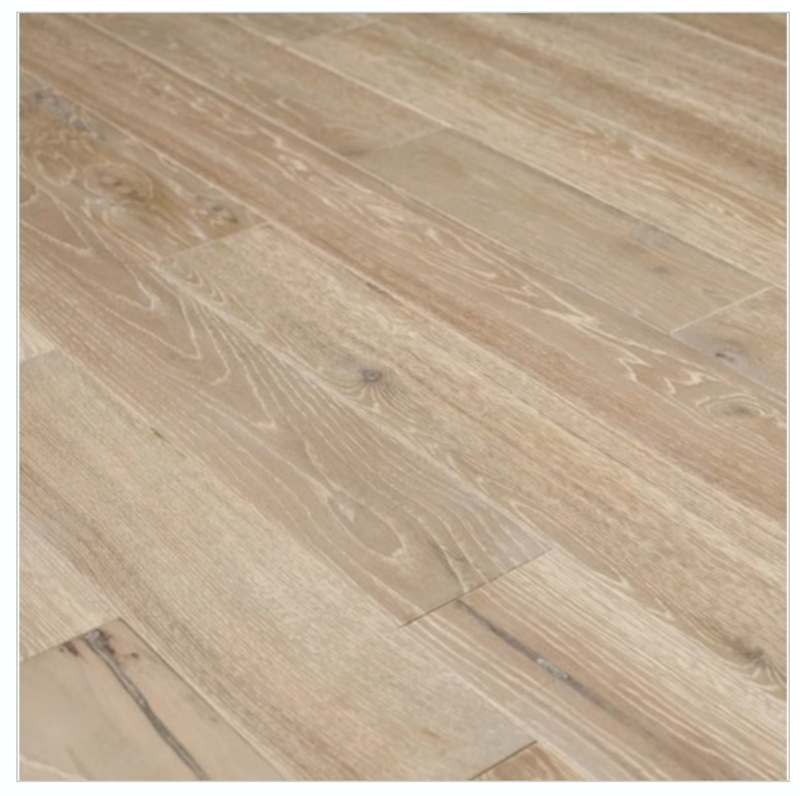 This is a white washed oak from Du Chateau Floors. 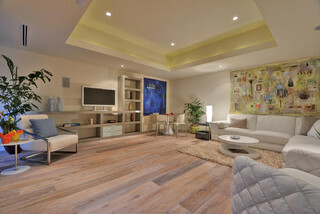 Of course, I was stunned when I learned how much additional this gorgeous floor would cost. Luckily, our builder has a great flooring guy who was willing to look for other options for us. We narrowed it down to these two. This is Treyburne Antique Chateau which is actually a porcelain tile. You’d be amazed at just home much this tile looks like hardwood flooring. It could be a great choice since the maintenance would be so easy. This option would cost about $300 more than our flooring allowance. Sometimes when you have large areas of tile an anti fracture membrane is recommended for an additional cost of a little more than $1 a sq foot. Tiles that crack due to being laid in a long expanse are not covered under the home owner’s warranty; so this anti fracture protection would be a good idea. With the anti fracture protection the above budget cost would be about $1.40 sq. foot. 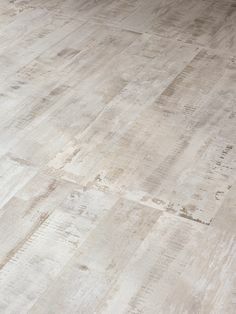 This is a Naples white washed birch hardwood floor. The additional cost for this floor would be about 75 cents a square foot. It’s very close in color to the Du Chateau white oak. We decided to go with the Naples white washed birch because we really wanted hardwood. Truthfully though, we gave considerable thought to the tile because of the durability and ease of maintenance. Kitchen Backsplash — Not So Easy! 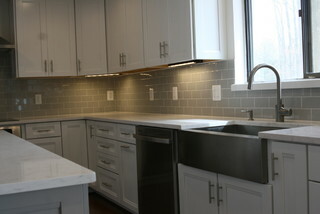 The kitchen backsplash is the next big decision that needs finalizing. 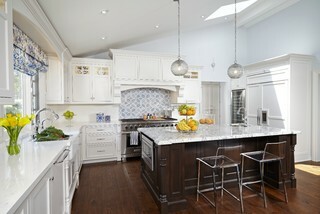 I’ve shared some of the styles of kitchens that I like in previous posts. We choose a Daltile Rittenhouse 2×4 Desert Gray tile in Matte finish (see photo below) for the backsplash with plans for a special mosaic to go over the stove. That small area has the potential for being one of the most expensive areas in our house and so far it’s the area that’s been the hardest to decide about. I’ve had my heart set on the Polly in pearl and absolute white by Ann Sachs (see photo below) since we begin planning our new home. I knew it was expensive; but finally, I decided to contact a sales associate to at least price it. 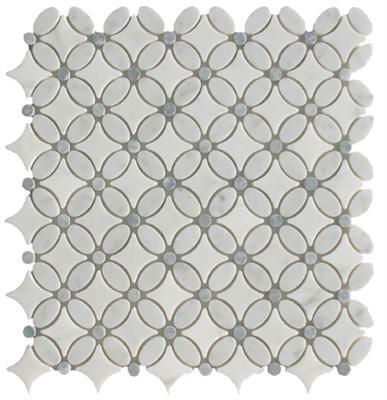 It is definitely pricey at $166 a tile plus the cost to finalize the design. Of course, it is very expensive and I really need to look at less expensive options. Once again the tile guy did his best to find some great options for us. These are the three choices that he had for us. The first two choices are about $250 above budget and the third is around $175 above. Complete this poll to share your opinion about which tile might look best in our kitchen. 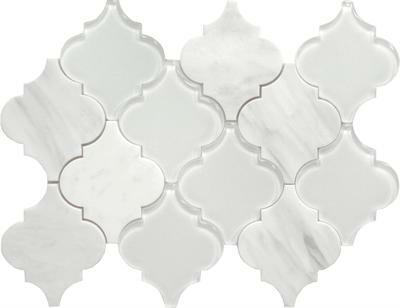 In my next post, I’ll be looking at accent tile for the master bath. I’d love to hear your suggestions. Click on the link at the top of the page, “Let’s Build a House”, for other posts about our process of building our home. Tags: backsplash, build a house, Du Chateau Floors, final decisions, hardwood flooring, lake house, Naples white wash Birch, Polly in pearl and absolute white, porcelain tile, Sosi. Bookmark the permalink.